Welcome back! Today, I’m pleased to spotlight the talented Emily B. Cataneo. Emily is a widely published author, and her fiction has appeared in Black Static, Interzone, and The Dark, among other publications. Her debut collection, Speaking to Skull Kings and Other Stories, came out earlier this spring from Trepidatio Publishing, an imprint of JournalStone. 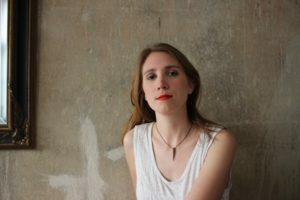 Recently, Emily and I discussed her evolution and inspiration as a writer as well as her plans for the future (which yes, do include a project with me!). Icebreakers are good! So I first decided to become a writer when I was a little kid obsessed with children’s books written by women about characters who wanted to be writers. I loved those characters, and I also loved reading and making up stories, so I figured, hey, why don’t I do this forever? I think lots of bookish children want to become authors when they grow up, but they forget about it as they grow older. I guess I forgot to forget! As for my favorites: as a burgeoning young writer, I was deeply influenced by Victorian Gothic authors such as the Brontë sisters and Oscar Wilde, as well as by more modern classics such as Angela Carter and Shirley Jackson. The contemporary authors who’ve influenced and inspired me the most are Kelly Link, Karen Russell, Karen Joy Fowler, Margo Lanagan and Catherynne Valente. But I’m always discovering new books that I love; my favorites so far this year were Alexander Chee’s Queen of the Night and Clare Beams’ We Show What We Have Learned: And Other Stories. 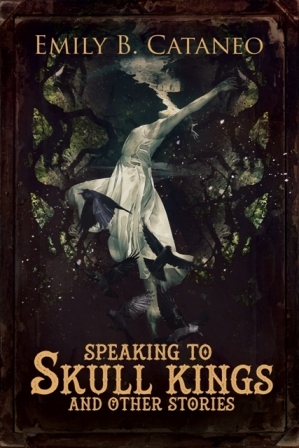 Congratulations on your debut collection, Speaking to Skull Kings and Other Stories! What inspired you to put together your first collection, and what was the process like as you selected the stories for the table of contents? Thank you! After returning from my time at the Clarion Writers Workshop last year, I started thinking about the projects I wanted to tackle for the rest of 2016, and one of those projects was putting together a short story collection. I realized I’d published a set of stories in 2014 and 2015 that all fit together and spoke to each other thematically, and that would work well together as a book. Then, lo and behold, Jess Landry over at JournalStone messaged me to ask if I had a collection to submit to her open reading period. Why yes, Jess, I did indeed! I think thematic cohesion is one of the most important elements of a short story collection, and so I selected the aforementioned thematically similar stories, as well as a few others that I’d written around the same time, and sent them off. Many of your stories deal with fairy tales, turn-of-the-century Europe, and the dance world. What is it about these themes that inspire you over and over again to write beautiful and haunting tales? Also, have you studied dance yourself? I think the origin of aesthetic influence is always such a complicated question, because these preferences are often not logical choices. That is, it’s not as though I make a conscious decision every time I sit down to write that I’m going to draw on fairy tales, early-twentieth-century Europe, and dance, but you’re quite right that I am intrinsically drawn to these as concepts, settings and themes. The best explanation that I can come up with is that these aesthetics remind me of the stories and images that fascinated me as a child, that they appeal to me on a sort of atavistic gut level. And then, of course, my zeal for these aesthetics becomes a self-fulfilling prophecy, wherein the more I write about, say, early-twentieth-century Europe, the more I read about it and learn about it and visit Europe, and the more inspired I become to continue to write about it. As for dance: the funny thing is that I’m absolutely, completely, truly horrible at dance. I am a graceless and clunky wretch who can run in a straight line for ten miles, but cannot bend my feet into anything remotely resembling an arch without my muscles seizing up in excruciating pain. Seriously. That being said, I love performance, opera, ballet: I’m intrigued by the strength of secret muscles and the precision of movement required to dance classically, and of course, the aesthetic can’t be beat. Maybe in another life, I’ll be a Russian ballet dancer myself. But not this one. Is there a particular time period or theme that you haven’t yet incorporated in your work that you’re looking forward to exploring in the future? My Clarion classmate Jenn Grunigen challenged me last summer to write some stories with the Emily aesthetic but set in space, or drawing on other soft science fictional concepts. I’ve dabbled with some ideas that meet that challenge, and haven’t finished anything yet, but I’d certainly like to! If forced to choose, which is your favorite part of the writing process: developing characters, crafting dialogue, or establishing setting? The answer varies between short and long fiction. For short fiction, I love establishing a mood and atmosphere via setting more than anything. I’m a very visual person, and drawing on all the images and tableau kicking around in my head, then connecting them with theme and plot and all those other story elements, is one of my greatest joys in short story writing. But when it comes to novellas and novels, I’m all about developing characters. The great fun of writing a novel is that you get to snuggle in (and by “snuggle in” I mean “go on a harrowing and disturbing journey”) and really get to know your characters, to watch them change and grow in your writerly hands. You feel as though you’ve gone through something with them, by the end of it. Out of your published work, do you have a favorite piece? My favorite published piece of mine is “Evangeline and the Forbidden Lighthouse,” which appeared in Interzone this month. This story includes a. ocean magic, b. questions of free will versus fate, c. class tensions on the coast of Maine, and d. female friendship. What’s not to love? I usually have one or two short stories cooking up, and right now is no exception, but my current big projects are a revision of my first novel, which is a fairytale-inspired story about four girls and a death omen that takes place in Germany in 1914, and a novelette that I’m collaborating on with Gwendolyn, which involves coercion and magic and ballet. Big thanks to Emily B. Cataneo for being part of this week’s author interview series. Find her online at her author website as well as Twitter and Facebook. This entry was posted in Fiction, Interviews and tagged JournalStone on June 20, 2017 by gwendolynkiste.